Encouraging Signs from Yu Darvish's Start, Yes – But is That Enough for You Today? 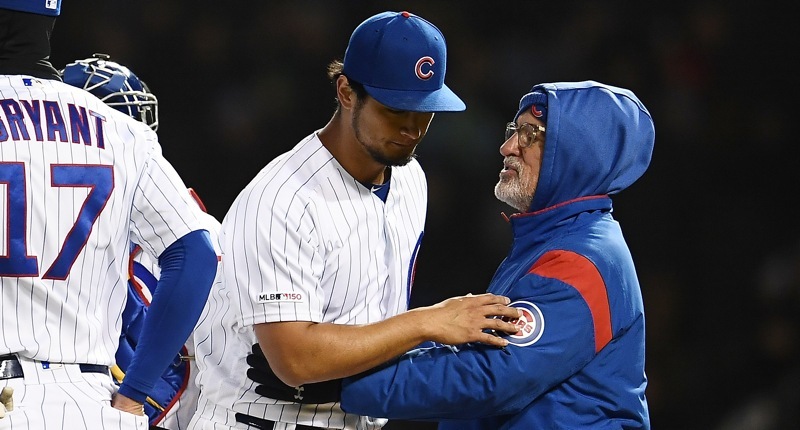 Although there’s always some nuance you could layer in, the Yu Darvish as a Chicago Cub story has pretty much always taken on a particular flavor: lots of hope based on talent, positive signals in the performance, bad results at the end of the day. To be sure, the sample on Darvish is still very small – just 11 starts, barely a third of a season – even if it’s been spread across more than a year. And those positive signals, including last night, are real. They’re there. I can see them. But, at the same time, I recognize that there does come a point at which we need an actual strong and productive performance to actually feel like this is going somewhere positive. At age 32, with a lot of miles and now multiple arm surgeries in the can, it’s not like it’s a guarantee that Darvish will start performing well simply because he’s still very strong and talented. At some point, we’ve just gotta see an actual good start that doesn’t require any kind of “ah, but this!” context. To that end, Darvish’s night last night was really another one of those “ah, but this!” type starts. 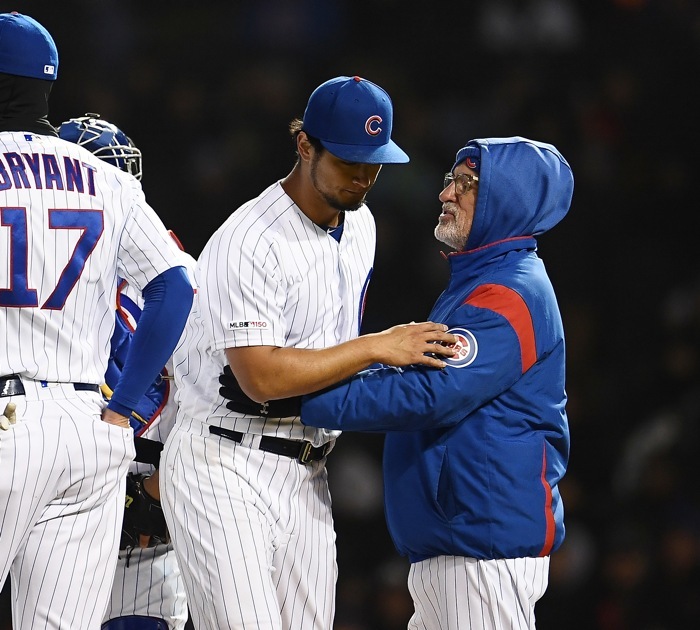 He threw the ball very well, he commanded it well most of the night, didn’t walk anyone, got an absurdly good volume of called and swinging strikes, and didn’t seem to be negatively impacted by the elements or the atmosphere. You can still take plenty of positives away from the start if you’re not burned out on that kind of thing. I know, you’ve heard this kind of stuff before, and many of you are rolling your eyes. That doesn’t make Maddon wrong, of course. The home runs he gave up were very surprising for the conditions (indeed, chucking fastballs down the pipe was not necessarily a horrible strategy on a night like that), and Francisco Cervelli’s is a home run at Wrigley and likely nowhere else in baseball. Even two of the runs that eventually scored “off of Darvish” came following his departure, and were scored by guys who had reached on nothingburger soft hits. In another life, those two are routine outs, and Darvish complete six excellent innings, and this conversation looks different. And I guess that’s the thing that makes being rational here so hard. On the one hand, I KNOW the sample is small and the “explanations” for performance are legit. Performance versus results? I know what I saw. Darvish performed well last night, even if the results were mediocre. But on the other hand, can’t Darvish just get a full-on great start’s worth of results at some point? Can I just enjoy some more of that, as a fan? OK, so I realize even that’s a little irrational. Of his eight starts last year, three of them were really quite good. So I guess it’s not like it hasn’t happened at all for him as a Cub. It just feels that way sometimes, when we’re left the day after a start to pick apart what went wrong, and why it doesn’t necessarily mean Darvish is to blame for the bad results. However true that might be – and it is, in this case – we watch these games as fans to see some great performances over time. I just really want to see one from Darvish again. Next Post Next post:What the Heck Did Ozzie Albies Just Sign? Maybe the Worst Extension Ever?